Meet the Little Bigfoot Cow. She is about 7 inches tall. 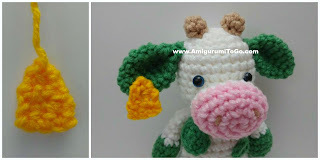 This cow is part of a series of animals that all use the same basic body pattern. You will need to make the basic body, link in the supplies list, then come back here for all the parts that make it a cow. 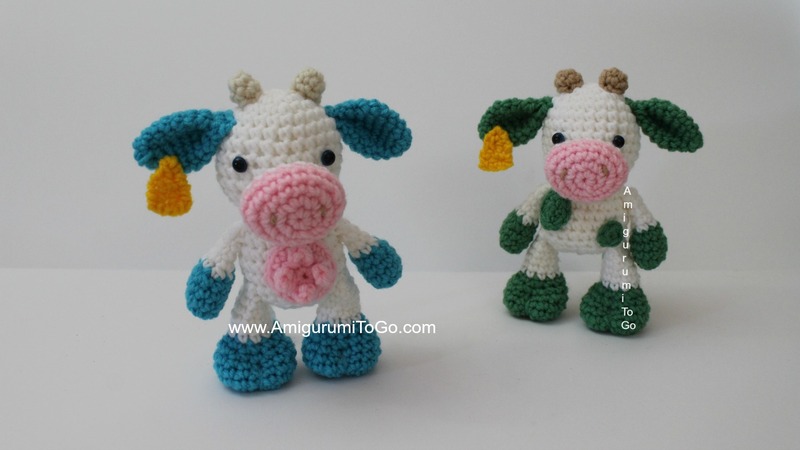 I named the first cow I made (the one with blue hooves) after one of my heroes, Temple Grandin. If you've never heard that name before, check out her website here she's amazing! Okay, now let's make the LBF Cow. Scroll down this page. Eyes: Feel free to play around with placements. The cows you see pictured have safety eyes in between the 7th and 8th row with 4 visible stitch holes between them. The top of the muzzle is sewn on or about row 8 and the bottom on or about row 11. Whip stitch 2 nostrils in between the 2nd and 3rd row before stuffing. Knot yarn tails inside muzzle when done. Stretch the muzzle out with your fingers before stuffing, stretch it out side to side then stuff. Pin in place before sewing, use lots of pins. 9) Do not stuff ears. Fold ear and sc through both sides across. There's no need to go through the middle part of the fold, just go through the outer edges. f/o leaving a long tail. To clean up any rough edges or holes, use the finishing yarn tail to wrap around the edges then weave in and out of any holes in the tag. Horns: make 2 using any color you want. 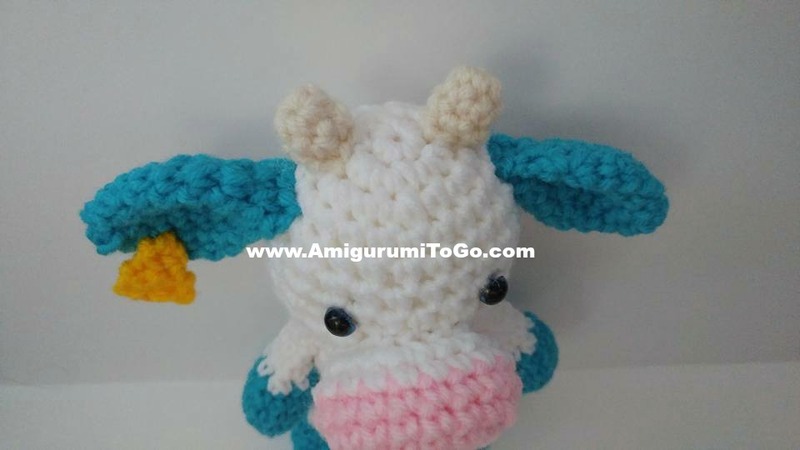 If you made the body with white yarn then consider using beige or tan for the horns so they stand out better. Use the same color as the patch, I'm using white for these photos only. I found it easier to make 2 udders then stop. Bring both yarn tails of an udder to the back side of the patch, through different stitch holes, knot them off and cut them up shorter. 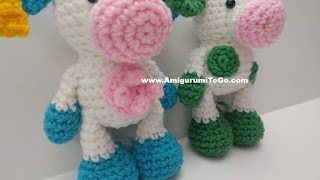 Once those yarn tails are out of the way, go on to make the other 2 udders and finish off the same way as the first 2. 2) 2sc in each st (12) sl st next st and f/o leaving a long tail for sewing. When you sew a patch to the tummy, keep your stitches on the inside edge of the patch. Sewing on the inside will give you a clean edge around the patch. If you are giving this to a small child then you will want to add extra holding stitches to the patch. These will wrap around the outside edge. 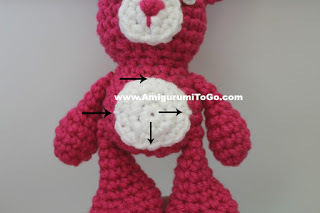 Put one on the top, bottom and on both sides, as pictured on the bear below, so that the patch can not be pulled off. Sew gently, don't pull any stitches too tight or you will alter the shape of the patch. You could also hot glue the center of the patch then sew around the inside edge. Do not put the hot glue close to the edge of the patch or it could ooze out of the sides and be visible. Tail: with same color as body, begin with a long tail you can use to sew the tail to the body. Pull 4 strands of yarn, the same color as the ears, through the end of the tail and knot each one. 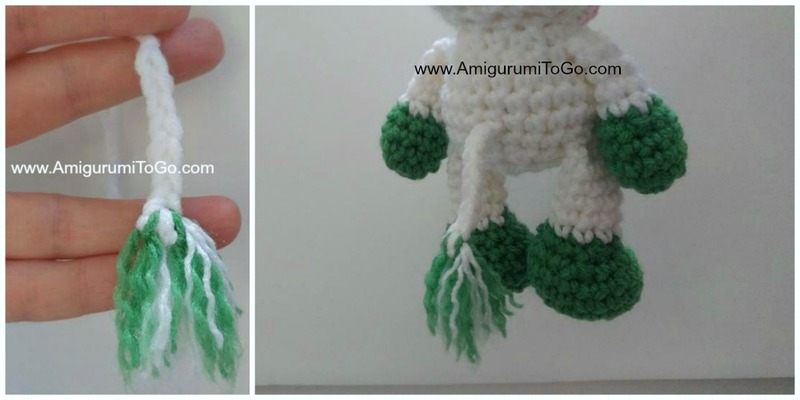 Pull 3 strands of yarn, same color as the body, through the end of the tail and knot each one. Cut the strands up to about 1.5in (4cm) long. Twist each strand to unravel it, use your yarn needle to fray and separate the strands. Temple is adorable! Thank you! 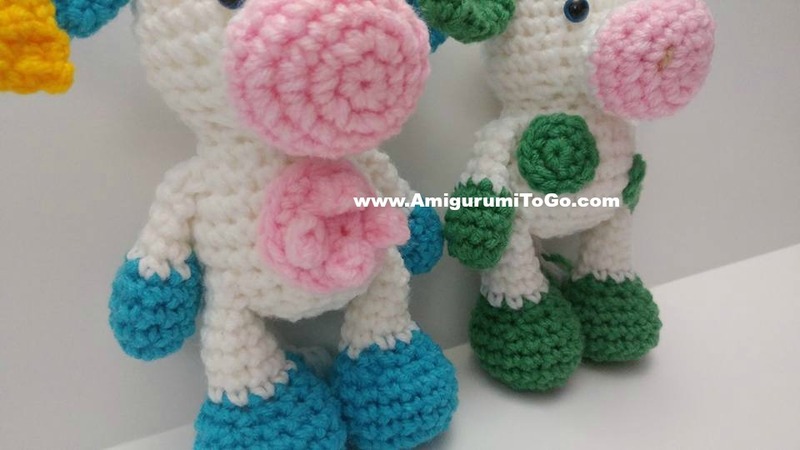 I'll be starting this pattern soon, but have a question before I start. Is there a pattern for the hooves? go to the supplies list, there will find the link to the basic body. The basic body is part of a series of animals. You need the basic body to make each animal. In this pattern you find the parts that make it a cow.